Get ready to paint Musician, Dean Zook of the Great Falls Symphony! 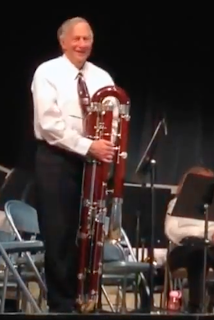 The contrabassoon was developed in the mid-18th century; the oldest surviving instrument, was built in 1714. Gustav Holst gave the contrabassoon multiple solos in "The Planets", primarily in "Mercury, the Winged Messenger" and "Uranus, the Magician"
The Great Falls Symphony began in 1959. Playing to a wide range of listeners. The Symphony attracts various special guest performers, many of whom are sought around the world. Often playing to full houses at the Mansfield Theater within the magnificent WPA era Civic Center. A tradition of exceptional music, and extraordinary musicians. 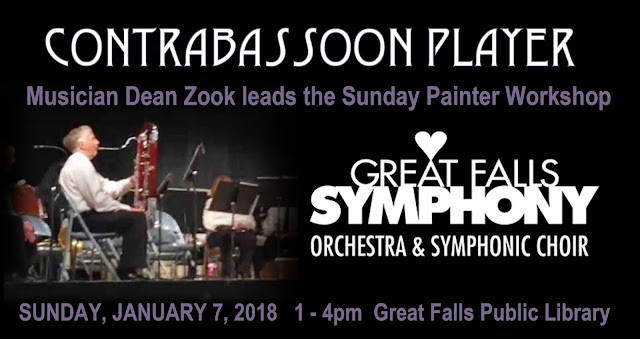 The Great Falls Symphony is dedicated to producing musical programs of the highest quality, and strives to be a resource for creative expression, artistic development, economic vitality, and continuing music education. Please bring your own supplies to Sunday Painter workshops. Supplies are not provided to attendees, sorry. Mediums allowed are: OIL PAINT, INK WASH, watercolor, acrylic, gauche, pencils, pens, charcoal. For those of you painting, please bring your own waterproof drop-cloth.